Home North AmericaCanada	Lights, camera, great distraction! Jet lag can sometimes be a good thing, and it certainly was in the Yukon, where  Zora Regulić witnesses one of nature’s most spectacular displays. The curtains in my north-facing room are wide open and I start to focus on the movement in the sky. Is that what I think it is? Holy Moly, it is! The Aurora Borealis, or Northern Lights, are giving me a show. I sit mesmerised for two hours as the lights flash in random shapes and sizes behind the clouds. If it looks this good in the bright lights of the city, it must be amazing out in the darkness of the countryside. I can’t wait to book an Aurora tour first thing in the morning. Aurora tours are big business as winter approaches and the nights get darker, but I’m here at the end of summer. 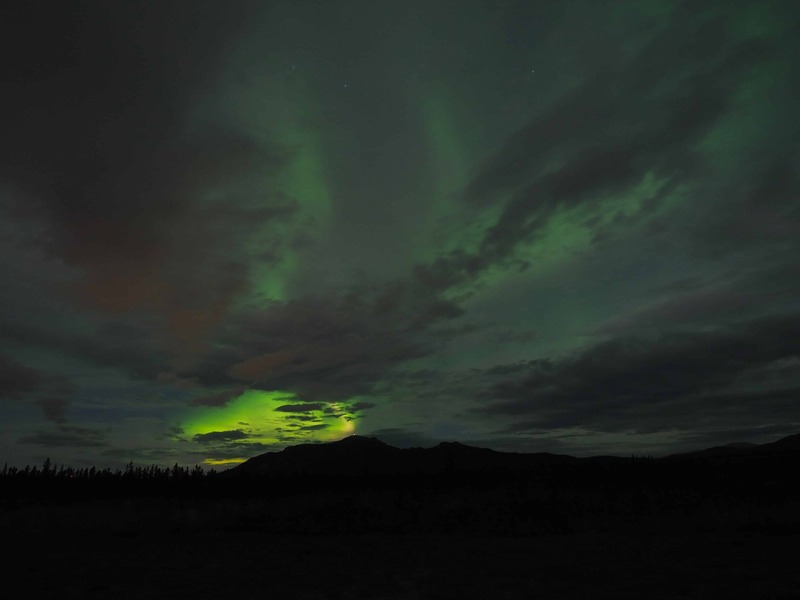 What are the chances of a good Aurora viewing? There’s a full moon the next night and it’ll be cloudy. The online Aurora activity forecast has a three-day rating from 1-10. What I have just witnessed is a “quiet” 3, but the following night is going to be an 8! 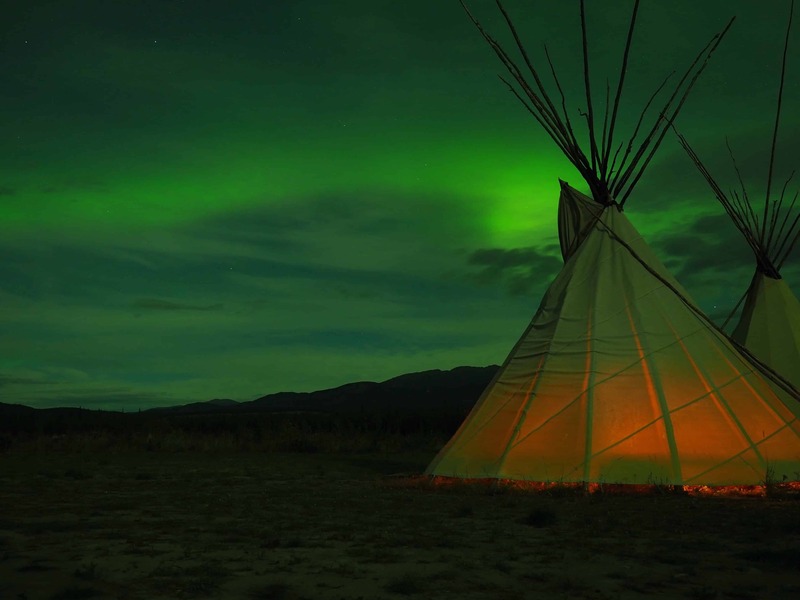 This may be my only chance to see this amazing spectacle, as the forecast is for rain later in the week and then I leave Whitehorse for the extra bright lights of Vancouver. I call Arctic Range Adventures the next morning. “Will there be a good Aurora viewing tonight?” I ask, but their experts can’t give any guarantees – a lot depends on the weather. I take my chances and book the tour. Part of the adventure is heading into the unknown (for me, hopefully not my guide). I’m on for a 11.30pm departure from our hotel and our guide Maki, from Arctic Range Adventures, arrives in a mini bus right on time. Heading out along the Alaska Highway, we quickly leave the city lights behind us and soon turn off onto a winding dirt road, arriving at the viewing site, an expanse of cleared land surrounded by spruce, pine and fir trees. 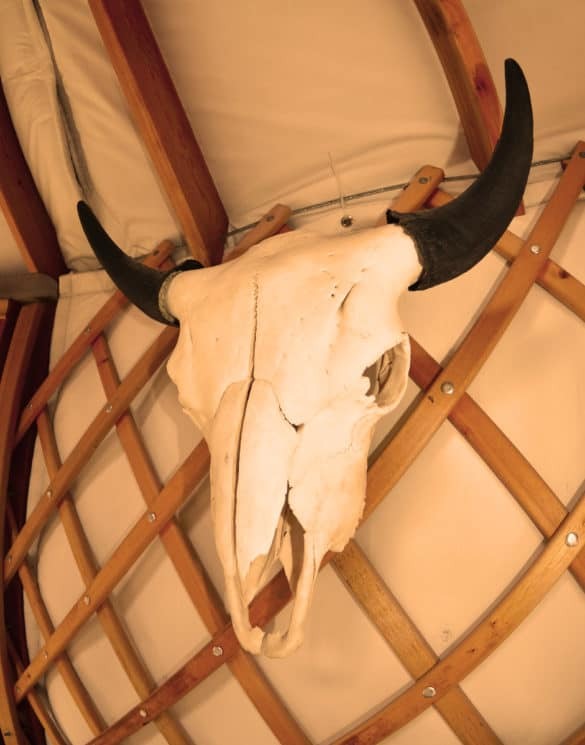 Two cosy yurts and two tipis have been built as a place to warm up over the four hours at the site. Maki lights a fire in one of the tipis to keep us ill-equipped travellers warm (tonight it’s a balmy 3˚C but in winter the temperatures can drop to as low as -30˚C). If you need to regain the feeling in your fingers and toes, the yurts have all you require – a pot-belly stove, tea and coffee, tables and chairs. The low lighting, moose antlers and snowshoes on the walls and the wooden sleds hanging from the ceiling all add to the ambience. 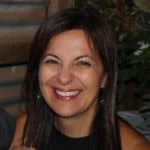 But watch out for the bear skin draped over the couch – its head and toothless grin may startle you if you lean back and come face to face with it. 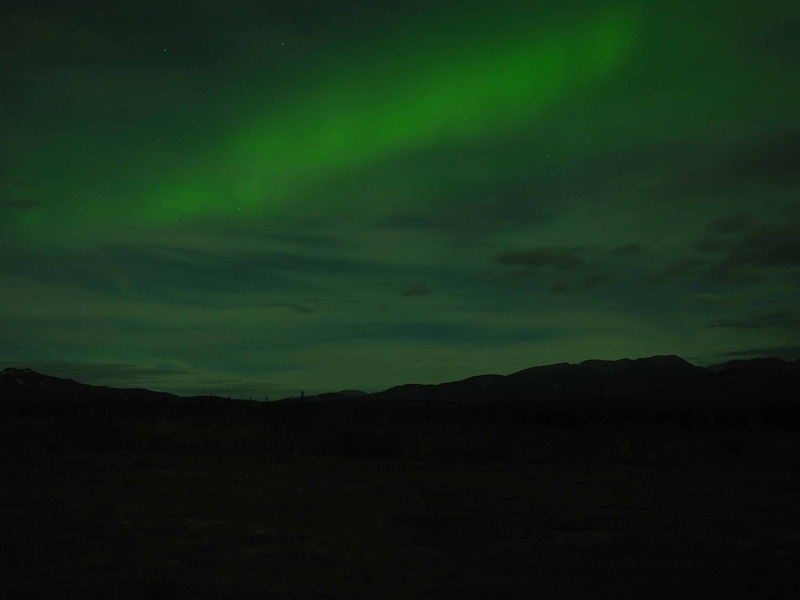 We head outside armed with our cameras and tripods and don’t have to wait long for the show to begin – the green and red lights start dancing behind the broken cloud cover on the horizon, then across the sky above us, sometimes enormous swathes, sometimes small bursts. My excitement level hits 10 on the Aurora scale. “There! Over there! Look over there!” I keep calling out, as if my companions can’t see what I’m seeing. The lights move sway and writhe with all the grace of a dancer. I can’t believe what I’m witnessing, just magic. But it’s not – it’s science. The Northern Lights occur when electrically charged solar particles and atoms collide with oxygen and nitrogen in the Earth’s upper atmosphere, causing those gases to emit light. Oxygen emits green or yellow, nitrogen gives off a red, purple or blue light. I’m grateful I have Maki as a guide – she also has an Olympus camera and knows exactly what settings I should use to best capture nature’s dazzling show. Tripods are a must. 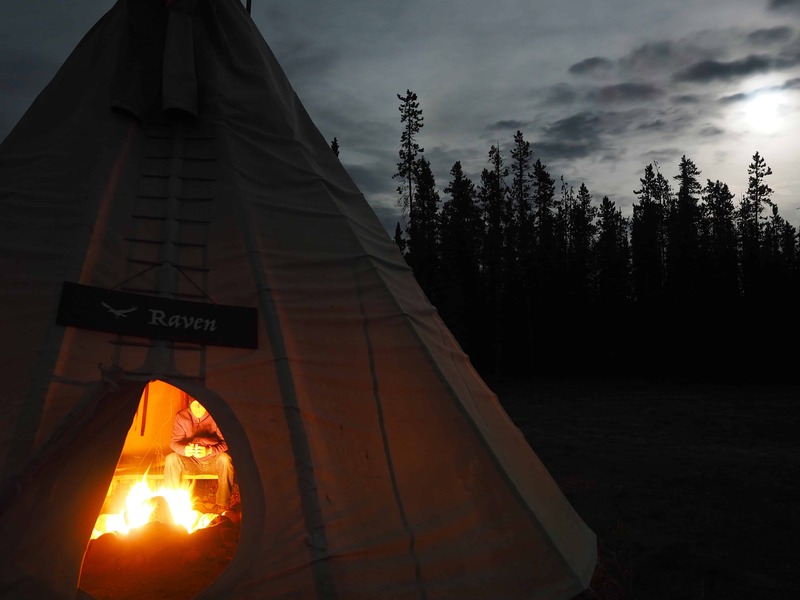 Defrosting in the tipi as the moon rises. Clouds close in to the north. 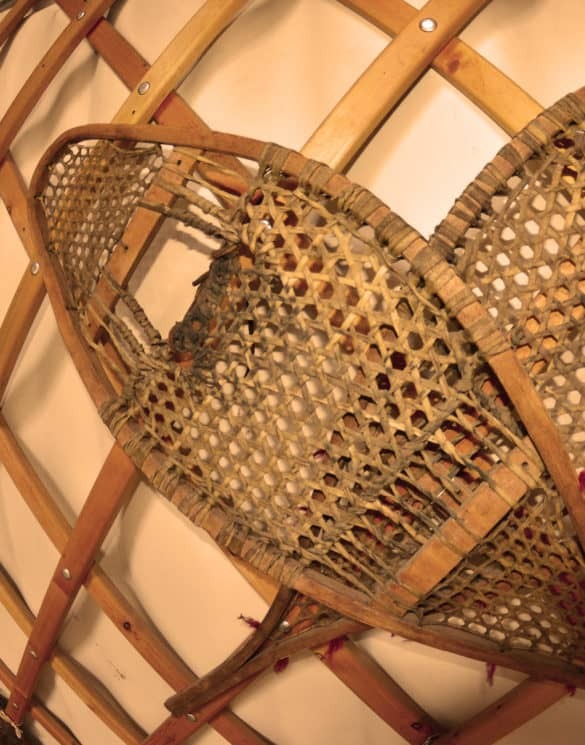 I take advantage of the break, defrosting in front of the fire in the tipi for a few minutes, but am soon out again – I don’t want to miss a thing. There’s the bonus of a beautiful moonrise, pine trees add to the ambience, all I need is a hooting owl to complete the picture. 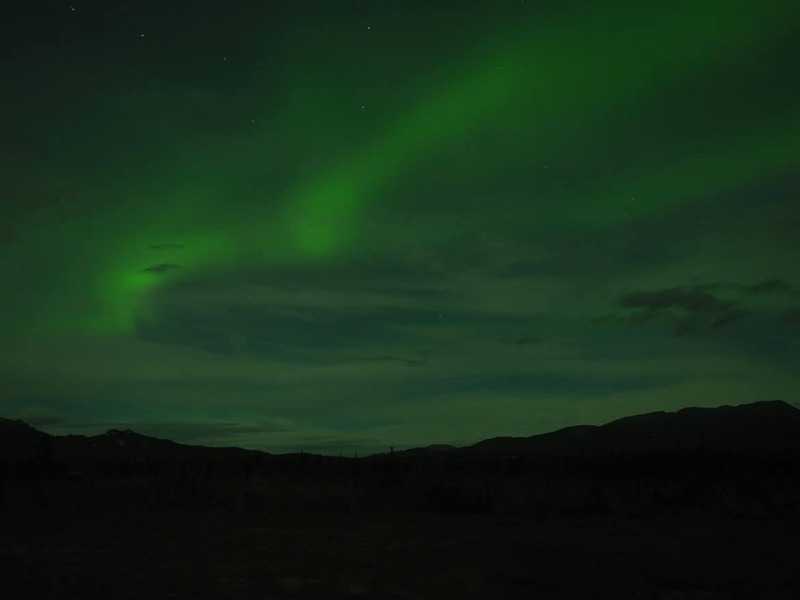 Zora Regulic travelled to the Aurora viewing at her own expense, and to the Yukon courtesy of Teds Cameras, Travel Yukon, Olympus and Adventure World Travel. More at Arctic Range Adventures. Photos © Zora Regulic. 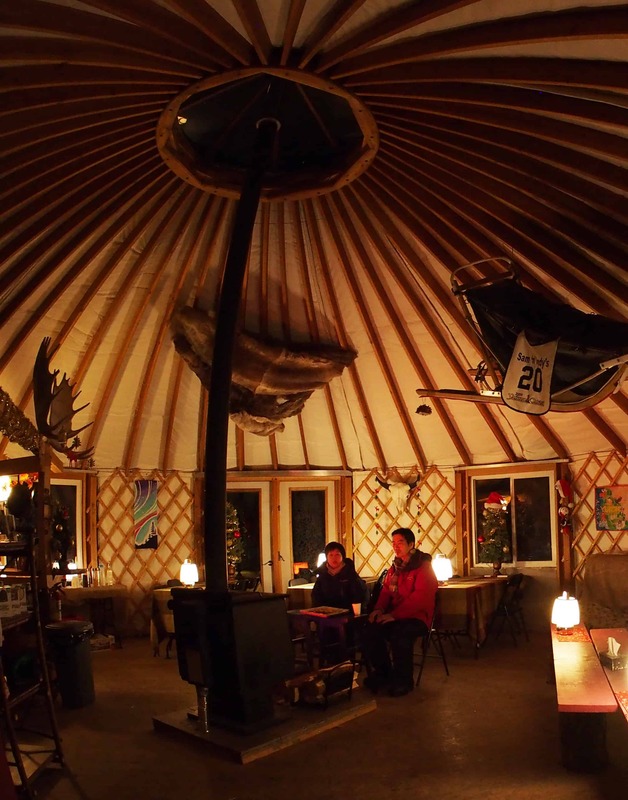 Yurt photos © Arctic Range Adventures.